watch a minute or so of this clip. From a labor-market perspective, the Affordable Care Act has little in common with the 2006 health reform law implemented in Massachusetts. Some employers are complaining about the $2,000 per-employee-per-year penalty they will pay beginning next year when the main provisions of the Affordable Care Act go into effect. The Congressional Budget Office also warned about the astonishing increase in marginal tax rates that middle-income Americans will experience, because the additional income earned by a family will be considered by the Internal Revenue Service as available for additional health insurance payments. One might guess that large changes like these would shock the nation’s labor markets, especially the markets for less-skilled workers for whom $2,000 is a significant sum, not to mention the costs of health insurance. The United States Department of Health and Human Services rejects these concerns, saying that the experience in Massachusetts suggests “that the health care law will improve the affordability and accessibility of health care without significantly affecting the labor market,” The Washington Examiner reported. The Urban Institute also thinks the Massachusetts results will accurately model the national market. If there were another country or region that had already tried the federal Affordable Care Act, we would learn a lot from the results, regardless of how much business people might be complaining. However, even though the Affordable Care Act and the Massachusetts law are both forms of “health reform,” and both seek to reduce the number of people without health insurance, they are quite different in terms of the labor-market incentives they create. One of several unique features of the Massachusetts law is that it attempts to leverage the exclusion of employer-provided health insurance from federal personal income tax for the purpose of getting insurance to the previously uninsured. The law encouraged employers to set up a “125 plan” that allows employees to use their own pretax dollars to buy health insurance. Under a 125 plan, an employer need not pay for employee health insurance: the employer only assists a bit in the administration of the premium payments and withholding. The premium payments themselves come from employee paychecks. And the 125 plans are for employees (who may buy insurance on behalf of their families), not for people without jobs. Even before the law was passed, Massachusetts employers typically offered some kind of health insurance plan to employees. The state law pushed a significant fraction of the remaining few to try the 125 approach by threatening to bill noncompliant employers for the uncompensated care their employees received around the state, a penalty known as the “free-rider surcharge.” So far, studies have found that enough employers took on 125 plans that ultimately no employers were liable for the surcharge. In contrast, the federal Affordable Care Act attempts to nudge the national labor market away from the federal tax exclusion for employer-provided insurance by offering large subsidies only to people who are not part of an employer plan, including people who are not employed. The act also passes judgment on the affordability of employer plans and penalizes employers who offer “unaffordable” plans and then have employees who receive the subsidies. The federal penalties can reach $3,000 per employee and are not deductible from business taxes. As long as they do something like the 125 plan to help their employees use the federal tax exclusion, Massachusetts employers are only nominally responsible for the “affordability” of health insurance or for failures of their employees to take advantage of the plan offered. The Massachusetts penalty is only $295 per employee-year (as far as I can tell, it is business tax-deductible, which makes the $295 less than one-tenth of the federal penalty); it can be avoided by an employer that makes nominal contributions to its employees’ premiums and induces enough employees to participate. Perhaps it’s wise for the Affordable Care Act to push in a different direction than Massachusetts did, because many economists think the federal personal income tax exclusion promotes health care inefficiencies and diverts much-needed revenue from the United States Treasury. But that wisdom doesn’t change the fact that the federal law will put very different pressures on employers and employees than the Massachusetts law does. It would be unwise to assume that next year’s national labor market will follow the patterns that the labor market in Massachusetts experienced after 2006. More differences will be noted in future posts. Take a look at these, especially the video debate linked from the second one. Do Transfers Stimulate the Economy? (about 2.5 minutes) Politically Incorrect (about 3 minutes) Will the ACA affect employment? (about 2 minutes) Unemployment isn't fun (about 1 minute) What are the effects of payroll subsidies? (less than one minute) Written testimony here. The videos were under oath. "In late 2009 when we began to see some glimmer of hiring returning to the economy; however, we were hit head on with a hurdle we did not anticipate. We had applicants applying for jobs, but only to protect their status for unemployment insurance." Stacey G. Reece, Spherion Staffing and Professional Recruiting [emphasis in original]. ... our local employers are exceeding frustrated. We struggle to successfully run our companies continually short-handed." Laws that govern training and licensing of physicians influence their incomes at least as much as health care demand does. Medical doctors are a critical part of the supply of health services and their incomes are an important determinant of health care costs. While a desire to help people motivates men and women to become physicians and go to work every day, that desire has existed for centuries and will continue to exist in the future and thereby is not the primary variable that causes physicians’ incomes to fluctuate over time. By law, physicians are educated people, the types of people who would have earned college degrees, if not advanced degrees, even if they had never become doctors. For this reason, the incomes of physicians depend on the supply-and-demand factors determining the incomes of college graduates generally, such as technological change and the emergence of worldwide markets in many products. As the wages of scientists, accountants, lawyers and other college-graduate professionals have pulled ahead of the wages of high school graduates, so too have the incomes of physicians, because most aspiring physicians have the option to enter another profession instead (Figure 2, on Page 37 in this paper, shows how incomes of physicians have been pretty constant relative to those of lawyers since World War II). You would think that a greater demand for health care, such as the demand associated with the aging of the population or perhaps a universal health care law, would increase physicians’ incomes as more patients (or insurance companies on the behalf of patients) compete for physicians’ time. And that’s true in the short run, because physicians take many years to train. But demand is less important in the longer term (a decade or two). In the long term, a relatively small increase in the incomes of physicians could be enough to attract a substantial number of physicians from pursuing other careers or from pursuing medicine in other countries (that’s one reason my Economix colleague Uwe Reinhardt concluded that the slow aging process was not a major cost driver in health care). Indeed, some of today’s physicians began their careers understanding that the population was aging and the health care industry offered many job opportunities (see also this paper on career choice and industry prospects). Barriers to professional entry may have a greater influence on physicians’ incomes than health care demand would by itself. Laws regulate the training and licensing of physicians and the tasks that can be performed by people without a doctor of medicine degree. The number of medical schools in the United States has hardly changed since the 1980s, despite significant population growth. Perhaps the restrictions on medical training and licensing are desirable, even though they raise physicians’ incomes. State laws are starting to widen the scope of medical services that can be performed by nurses and physician assistants to include services previously permitted only by medical doctors. Physician outsourcing has also been discussed. It is possible that the new health care law, with its emphasis on reducing costs, will apply pressure to ease restrictions on entry into the provision of health care services. On the other hand, centralized health care policy may naturally seek the advice of industry experts – especially medical doctors – who may appreciate the merits of keeping medical doctors closely involved with the provision of health services. The “earned income tax credit” is, ironically, more likely to be received by unemployed people than by workers who do not spend any time unemployed. The credit was created years ago to reduce tax burdens on the poor and to “provide a genuine incentive for working;” a household must have some wage and salary income in order to receive the credit. However, because the credit is administered on a calendar-year basis and is phased out with calendar-year wages and salaries, it is disproportionately received by people unemployed after a layoff. As I illustrated in an earlier post, the credit follows a mountain-plateau pattern: an increasing portion for the lowest calendar incomes, a flat portion, a decreasing portion and then a flat portion of zero. You might think that unemployed people do not receive the credit because they do not have any wage or salary income, but typically people unemployed from layoff do have wages or salary income during the calendar year of their unemployment from their previous job. Their layoff might have occurred after the beginning of the calendar year. Even a layoff occurring in December of the previous year might generate wage and salary income in the current year because of a severance payment or accumulated sick and vacation pay. Moreover, an unemployed person might have a spouse with wage and salary income, and the spouse’s income counts toward the credit. Because unemployment compensation is supposed to be reported on the recipient’s federal individual income tax return, I was able to further investigate this issue by examining a large sample of individual income tax returns for the years 2000-07 provided by the Internal Revenue Service to the National Bureau of Economic Research and other institutions for research purposes. In 2007, 97 percent of the 7.6 million returns showing unemployment-compensation income (that is, the taxpayer or spouse was unemployed and receiving benefits some time during the calendar year) also had wage and salary income during the year. That percentage was essentially the same in each of the years 2000-06. Of the same 7.6 million returns with unemployment income in 2007, one quarter received the earned income tax credit. By comparison, the credit was received by only one-sixth of the returns with wage and salary income but no unemployment income. Among returns with unemployment income, the average earned income tax credit was $486, compared with $347 among the returns with wages but not unemployment income. For most of the returns with both unemployment income and the earned income tax credit, the credit would have been even greater if the taxpayer had been employed fewer weeks than he or she actually was. Still more returns with unemployment income but no earned income tax credit would have received the credit if the unemployment had lasted longer. This situation occurs so often because unemployment benefits are based on a person’s weekly work situation while the earned income credit is based on a household’s annual wages and salaries, and because weekly unemployment benefits by themselves are usually less than weekly wages and salaries. 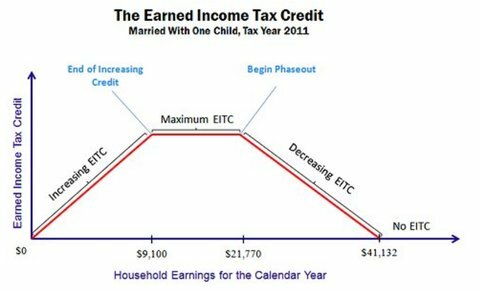 The earned income tax credit is thus a good example of how a so-called tax credit can act like a tax from a working person’s point of view.